For more than 1000 years Arunachala Giripradakshina – circumambulation of the holy mountain Arunachala – has been extolled as a way to achieve mukti, liberation or enlightenment. Each year millions of people, primarily South Indians, come to Tiruvannamalai on full moon nights for Girivalam (Tamil for Giripradakshina). The present Pradakshina route was set about 900 hundred years ago, by a Pandyan king, Vikkirama Pandya. Famous saints and sages from over the ages have extolled Girivalam for its spiritual benefits. Most recently this was done by Bhagavan Sri Ramana Maharshi. I have written a number posts that show this Arunachala Giripradakshina route and the holy places that line it. This page is a way to navigate to these postings. This post gives and overview of many of the 100 (or so) temples and shrines alone the Pradakshina route. Most of them can be seen in this post. Temples and Shrines along the Giripradakshina Route. This entry was posted on November 27, 2010 at 7:20 am and is filed under Arunachala, Pradakshina, Ramana Maharshi, Spirituality, Tamil Nadu, Temples, Shrines and Ashrams, Tiruvannamalai. You can follow any responses to this entry through the RSS 2.0 feed. You can leave a response, or trackback from your own site. Well I am coming for a very quiet, non-social time with Lord Shiva and The Maharshi (I’m sure you understand perfectly what I mean by that) but I will be there for well over a month so I have absolutely no doubt we will meet and I look forward to it. Probably on Pizza night ! Quiet time here is the best. If you want some caves to hang out in, I can probably get you a good place or two. Great, can’t wait, I’ll be there in about 6 weeks all going well. Your blog has been extremely helpful, thanks. Maybe I will meet you when you are here? Excellent, thanks. So do the eight lingams also partly act as sort of places of rest and shelter for those walking the route ? Certainly they can. There are many places to rest along the route. What’s the Yama Lingam ? Is that a temple ? What does that mean ? Thanks for taking the time to do all this work, it’s really appreciated. 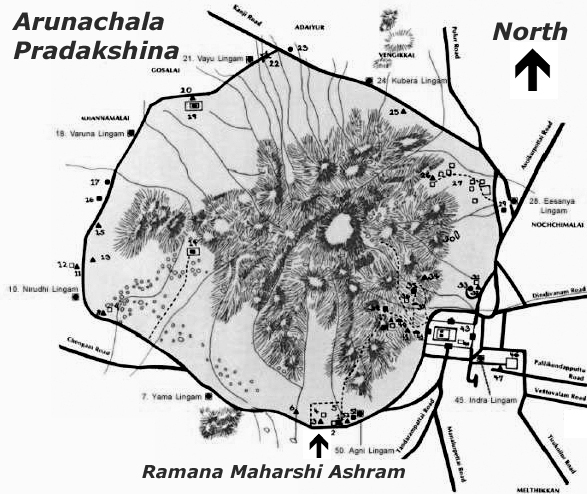 Around Arunachala, on the Pradakshina route there are eight lingams at the cardinal points (e, se, s, sw, w, etc). Lingams are representative of Siva, and are places to worship Siva. These eight lingams are said to be created by various Hindu deities. When walking Pradakshina from Ramanasramam, this is the first of these eight lingams. Around Arunachala, which is said to BE Siva, there are these eight special places at which to worship Siva. Siva is said to be the formless Consciousness that is the substratum of all existence – of the universe and of each of us.